With closed eyes indicating that he is in the midst of a vision, Saint James the Greater sits in a boat while Jesus tells him to go to Spain to preach. The boat not only refers to his imminent journey but also presages one further in his future. After preaching in Spain, James is said to have returned to Judea, where he was decapitated; his head, set adrift in a boat, miraculously washed ashore in northwestern Spain, where it was then buried and forgotten. Its later rediscovery heightened interest in the saint, and his relics attracted many Christian pilgrims. In the miniature James holds a staff, a symbol of pilgrimage to the site of his relics at Santiago de Compostela, Spain. This image prefaces a suffrage, or prayer, to Saint James the Greater. The scene is set in a deep landscape, in which a meandering river connects background and foreground. In the distance, fortified castles dot a hill while boats sail near a harbor. 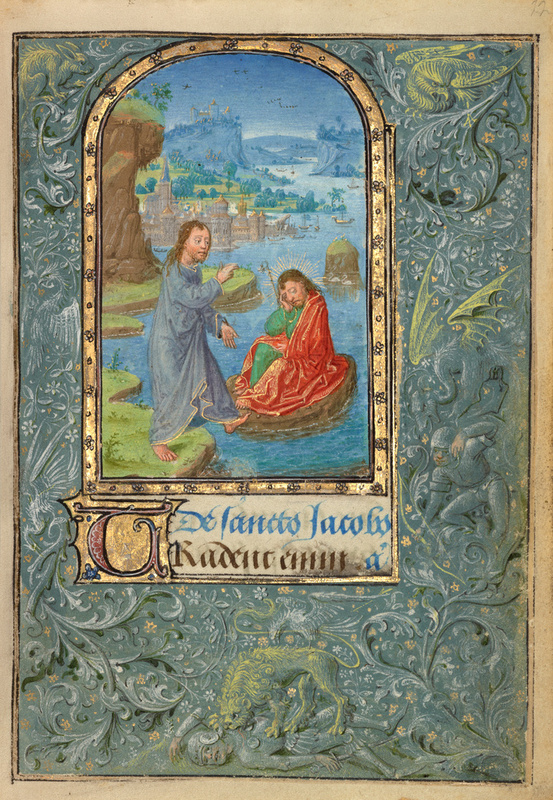 The illuminator Lieven van Lathem harmonized this landscape with the green and blue border that encloses the whole page. In contrast to the cool colors, James stands out in his bright red garment.